In this tutorial, we will see How To Create Multilingual Website using Laravel Localization. For this example, we will use Laravel 5.8, and we will do it from scratch. If you are not familiar with Laravel 5.8, then please check out my Laravel 5.8 CRUD Example. There are so many different ways, like using the third party packages or build it from scratch using localization of Laravel. You can make the Middleware to handle a localization based on the user’s selected language, or you can use localization based on a specific route. 4 Step 3: Setup the view. Laravel’s localization features provide a convenient way to retrieve strings in various languages, allowing us to support the multiple languages within your application quickly. Language strings are stored in the files within the resources/lang directory. Within that directory, there should be a subdirectory for each language supported by the application. We will create the middleware to check if the locale is set then change the locale of the application. So let’s get started by installing a fresh copy of Laravel. 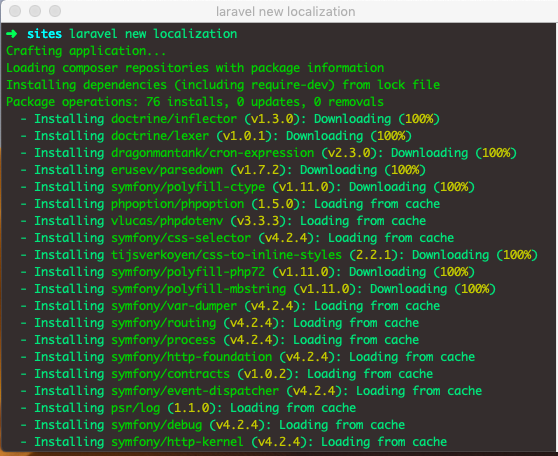 Right now, Laravel’s 5.8 version is the latest version. Yours might be different from me depending on the future. Go inside the project. For this project, we do not need to connect our application to the database because it is a frontend. So, I am not connecting this laravel app to the database. It is related to the frontend and not the database because we do not need for this example. By default, our application’s local language is English or en. You can find it on the config >> app.php file. Here, the locale is set to en. Now, if you check the resources >> lang folder, there is one folder called en, in which there are some files like auth.php, pagination.php, passwords.php, validation.php. So, these files are translation files. Let’s check the auth.php file. So, this file returns an array which has key-value pair. So, here you can define any key you like, but the values are on your language specific statements. An app.php file’s root folder name is en, so translation to these file’s statement is in English language or en, if the root folder is fr means french translation then the app.php file might look like below. Remember, you need to add the same keys for all of your translation files across the different languages, change the values respective to your languages. In the above code, we have written two items, which are failed and throttle and the values are translated into the French language. So, when the user changes the languages, these statements will be displayed because in the view file, we will call it by its key and due to middleware it will map to the correct languages. Okay, now we will go for three languages. English is already there. 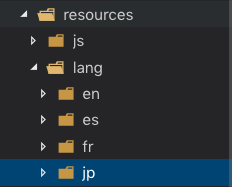 So, let’s create a folder inside the resources >> lang folder. Now, inside all of the four folders, create a file called sentence.php and add the following code. And last, jp >> sentence.php file. You can put as many texts as you want. I have just taken one text for this demo. Now we have placed all translations in place, let’s start working on the views and make our application load above translations. Step 3: Setup the view. First, create layouts folder inside resources >> views folder and inside that layouts folder, create an app.blade.php file and add the following code. Now open your welcome.blade.php file, which is by default inside the resources >> views folder and place below code which includes a markup just for a languages dropdown. Now, inside routes >> web.php, add the following route. Define a lang method inside the HomeController.php file. You can create a controller using the following command. Write the following code inside that file. So, this function will see the locale and put it into the session. Now, create a middleware using the following command. It will create a file inside the app >> Http >> Middleware folder. Now open your newly created middleware file called Localization.php and update the handle method with below code. So, our final file looks like below. Now add the middleware in App\Http\Kernel‘s $middlewareGroup’s array like so. Now, one final thing is remaining. Add the following code inside the resources >> views >> layouts >> app.blade.php file. In the above code, if we change the language, dropdown still shows Language instead of the current locale. We can fix by adding a switch statement and check what locale we have and based on that we will show the current locale with a flag icon like below. Finally, add the following code inside the resources >> views >> welcome.blade.php file. Here, I have used the trans() function which will take one argument, and it is the filename.array_key_name. Now, if you have done all correct till now, then go to the root route inside the browser, and you will see the drop-down with the four languages. Select the language, and you will see the welcome message in a different language. Finally, How To Create Multilingual Website using Laravel Localization Tutorial With Example is over.